For a number of years there was a lot of focus on medicinal marijuana and it’s potential legality. The hemp plant is actually used for a number of medicinal purposes. Aside from hemp oil and medicinal marijuana, CBD oil is also gaining a lot of popularity recently. Extracted from the hemp plant, CBD oil is used for a variety of health issues that includes pain management. Thanks to its cannabinoid content, CBD oil decreases inflammation in the body and helps alleviate a number of ailments in addition to pain. Because it is somewhat ‘new’ in its popularity, many people question ‘ is CBD oil legal ’? The answer isn’t necessarily and easy one. Let’s take a closer look at some of the details questioning is CBD legal in all 50 states. 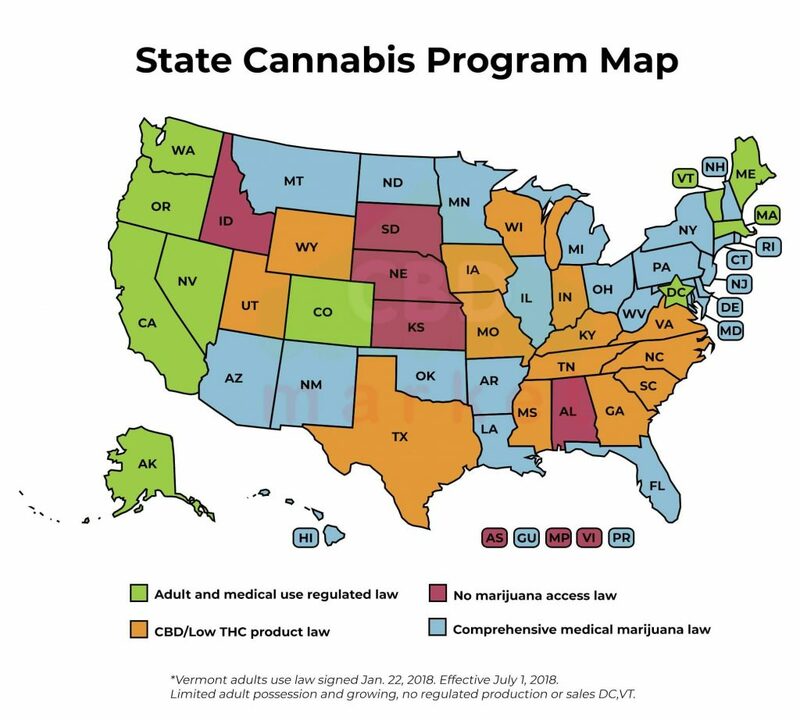 *Map is current on 09/06/18, check actual information about State Cannabis Program here. Is Cannabis Oil Legal ? Since cannabidiol is not listed within the Controlled Substances Act, it is believed by many that CBD oil legal in all 50 states is a true fact. Let’s break down the findings state by state. * If you don’t find your state please look on spreadsheet below with all 50 states. As we have seen, there are a number of different laws and regulations when it comes to CBD oil. Each state has taken advantage of their ability to determine what will happen in their own state, despite federal law making CBD oil legal at their level. In order to make CBD oil legal in all states there is a lot of work that would need to be done. Many states have already taken the necessary steps to make these products anything but legal. Some seem to be far more liberal than others when it comes to a person using CBD for chronic pain or any other condition. Other states very much want CBD to be used as a treatment for epilepsy. This potentially shows that a number of states just aren’t educated on CBD oil and its potential benefits for a number of conditions. If you are looking to use CBD oil you may want to look into your state’s legal terms. You could end up making a mistake with the purchase or use of a product. Always be sure to do your research and determine if medical documentation is necessary. Many companies are more interested in selling product that they don’t market their products properly. Many companies will sell CBD oil with the impression that it is legal to purchase and use everywhere in the United States. This is not the case. There are legal risks involved with using these products if you don’t know what you are obtaining. Is CBD Oil Allowed in Alabama? One of the first states to legalize CBD oil, Alabama passed a law back in 2014 that made it legal to use CBD for medicinal purposes. Any person using CBD oil as a treatment option for a medical condition cannot be punished for it. The Law is named ‘Carly’s Law’ after a young girl who utilized CBD oil for epilepsy. Is CBD Oil Allowed in Alaska? Alaska state law has said that doctors have the ability to recommend CBD oil and other related hemp products to their patients. They do not currently have the ability to prescribe it. Otherwise, Alaska follows the federal guidelines that are in place relating to the ability to buy CBD oil for sale. Is CBD Oil Allowed in Colorado? Colorado was the first state to legalize marijuana. It is extremely progressive at a legislative level. CBD oil is very much legal in Colorado whether you are looking to sell it or obtain it for medicinal purposes. Is CBD Oil Allowed in Georgia? Georgia is taking a much more conservative stance than many other states have been when it comes to making cbd oil legal in all 50 states, including their own. The lawmakers in Georgia are remaining very resistant to legalizing cannabis in any form. There have been some moves to potentially make CBD oil legal but for now the process is at a standstill. It is clarified by the state that CBD oil is legal at a federal level. It is up to Georgia to determine what their take will be moving forward. 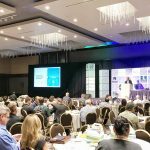 Is CBD Oil Allowed in Indiana? Just this year the clarification in Indiana was reassessed. Governor Eric Holcomb signed a bill that legalized cannabidiol as long as the THC levels in the product were low enough to meet requirements. No more than 0.3 percent of THC can be found in a legal product. It took over a year to come to this clarification. Each batch must be tested before it is available for sale. Is CBD Oil Allowed in Iowa? Iowa acknowledges that CBD is legal from a federal standpoint. However, the state has also said that it will be interesting to see what happens on a state level. Iowa currently supports the stance that the legal definition of marijuana includes any part of the cannabis genus. Is CBD Oil Allowed in Kentucky? Kentucky determined that CBD is to be excluded from the definition of marijuana back in 2014. It is legal for patients with epilepsy that have a written approval from a physician. CBD oil is legal in all parts of Maine. You can legally purchase and consume a CBD oil-based product as long as it contains less than .3% THC. You currently do not need medical documentation that outlines what you will be using the product for. It is not limited to use for epileptic seizures. Is CBD Oil Allowed in Mississippi? Mississippi was the fifth state to make CBD oil legal. Currently the law states that these products are legal for use relating to epileptic seizures. Other ailments like chronic pain do not fall under the umbrella of legality. Is CBD Oil Allowed in Missouri? Missouri has current legislation in place that makes cannabis oil legal in their state. CBD can legally be used for medicinal purposes relating to a number of conditions. It can be used for pain management, depression, anxiety, cancer, mental illness, arthritis, epilepsy and many other issues. Currently Nevada allows consumption of CBD in their state. However, farmers in the state of Nevada cannot grow hemp at a commercial level. Imported products that are low in THC can be sold in the state. The products must be made from the seed or stalks of the hemp plant. Leaves and flowers are not permitted. Is CBD Oil Allowed in North Carolina? Selling and obtaining CBD oil in North Carolina is legal thanks to the Farm Bill of 2014. The DEA has acknowledged that CBD that is sourced from the industrial hemp plant is legal. Is CBD Oil Allowed in Oklahoma? CBD oil is very much legal in the state of Oklahoma. It is easily obtained over-the-counter in many parts of the state. You can also purchase it online for medicinal purposes. Industrial hemp is utilized here thanks to its lack of THC. House Bill 1559 clarified the differences between CBD and marijuana. Is CBD Oil Allowed in South Carolina? On April 2, 2014 there was a law passed in South Carolina that made the sale and use of CBD oil legal. Additional testing is needed prior to being sold in the state of South Carolina. Is CBD Oil Allowed in Tennessee? A bill was passed in 2014 that made CBD-specific cannabis oil legal. This legality was only provided to patients who had medical approval diagnosing them with intractable seizures. The use of the CBD had to be part of a clinical research study. The bill was quite ineffective so in 2015 a law was passed making it legal for people in Tennessee to travel outside of state lines to obtain the oil. There are a very narrow set of circumstances that allow you to legally use CBD oil in Texas. 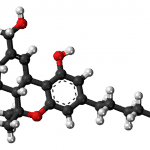 You must be prescribed CBD by a doctor for a serious medical condition if you are questioning whether or not is CBD oil legal in Texas. Is CBD Oil Allowed in Utah? Utah tends to be on the more conservative side when it comes to certain topics. For the past few years Utah has come out of their shell a bit and have attempted to legalize marijuana for medicinal purposes. The current plan for CBD oil in Utah is to allow its production. However, this process will be strongly governed and controlled by the state of Utah moving forward. It looks as though the final verdict on cannabis will be decided within the next year or two. Is CBD Oil Allowed in Virginia? Virginia has one of the most conservative CBD oil laws. Patients with severe epilepsy have a legal defense when using a CBD product that is over 15% CBD and under 5% THC. However, purchasing the product is still considered to be illegal. It looks as though some steps in the right direction are taking place. A lot of work still needs to be done in order to make cbd oil legal in all 50 states, including Virginia. Is CBD Oil Allowed in Washington DC? Washington has not yet taken individual action to clarify if consumption of hemp products is legal in their state. They currently are following the federal guidelines that are in place. This is promising. Many states that are opposed to the use of CBD oil took it upon themselves to clarify their stance. The fact that Washington DC has allowed federal law to dictate their current opinion on CBD shows that they may eventually make it legal. Is CBD Oil Allowed in Wisconsin? 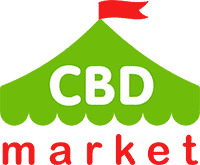 CBD products of all kinds can be freely distributed throughout the state of Wisconsin. This determination was made back in 2014 thanks to the Farm Bill that made hemp cultivation and usage legal. Since then, Wisconsin has backed this law and allows THC-free products to be sold. CBD Oil Allowed in Wyoming? Wyoming was the 16th state to legalize CBD hemp oil. This occurred in July of 2015 as part of the House Bill 32. The bill was approved by a 53-7 vote. Wyoming strongly supports the legal use of CBD. *Information above should in no way be interpreted as professional advice or legal counsel. The information provided in this table is based on independent research and, although we will try to update it as often as possible, the information may not always be accurate. If you notice that any of the information above is out of date, please notify us via email [email protected] and we can update the information accordingly. Each time when someone ask me is cbd oil legal in all 50 states I just sent this article and no more questions. I use cbd product for my back pain, dunno about others but it’s helps me. It’s ridiculous that they have not yet legalized for medecine in the whole country.